I have just had the most wonderful uninterrupted bath thanks to Craig for supplying the cocktail, British Gas for the hot water and the girls for staying quiet in their cots. I got to have a drink and read my Red magazine and felt very much like myself again and not a milk sodden children's entertainer/maid. I love family time but it's nice to get some time to myself. It is easy to forget what you like to do when you spend all day, every day doing what other people want. I feel pleasantly merry, cleaner, younger and happier. I thought I would have a quick blog before the chinese turns up. Bedtime is my new favourite thing. Edie gets to paddle in the water while Freya enjoys her toys and then we divide and conquer with Craig sorting Freya out and I take Edie to our bedroom to massage then feed her. Edie and I get to lie on the bed listening to Craig reading the bedtime story. 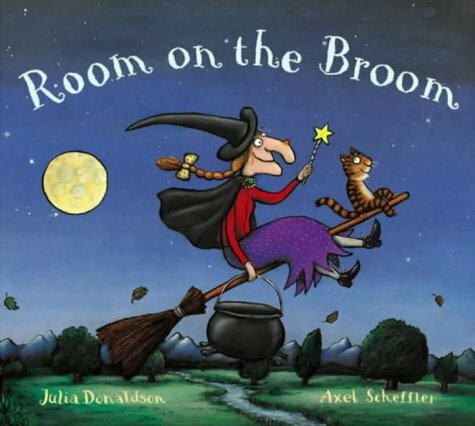 He has a varied selection of voices, my personal favourite is his Rhod Gilbert-inspired dragon voice for 'Room on the Broom', a Julia Donaldson book. Julia Donaldson wrote 'the Gruffalo' and her books are wonderful. We have recently moved on from very simple boring books (such as 'That's not my monkey...') to stuff that has a bit more of a story. I recently discovered the blog 'The ramblings of an everyday mummy', in one of her posts she talked about favourite children's books. I read her recommendations and also other books suggested in the comments section and ordered a few from amazon. Story telling is just so much more fun now. The boiler had been playing up recently. The water was going hot and cold and we were unable to run a warm bath for the girls. After calling out British Gas, they told us that the system was 'sick' and needed powerflushing and preferably replacing. A heart stopping amount of money later, we have a new boiler and clean pipes. The water is so hot that we had to turn the temperature down for fear of burning ourselves- it makes for a great bath/ shower experience. The house is nice and toasty too which is good because the temperatures have been falling to minus three outside. We have been out at Elodie's second birthday party today. Freya and I joined them for a birthday picnic on Monday but today was the day of the party. Nicola bravely arranged for 40 people to come to her house and had outside caterers do 'Pie and Peas'. The event was a real success, it was great from our point of view, Edie spent a lot of her time being cuddled by aunty Becky and slept all day long whilst Freya enjoyed the indoor trampoline, lots of people complimented us on how independent Freya was as she happily mingled around the 'play area'. Nicola, who is an excellent baker, made Elodie's birthday cake. She did say that it had turned out "a little eighties"- I hope she didn't mind me saying but I immediately thought Fanny Craddock. Well done for a cute and tasty cake though. As an aside...the nice thing about having girls is the beautiful clothes. I don't usually spend a lot of money on Freya's clothes but seeing as how it was a party... I got a new dress for her and bought some ugg type boots.